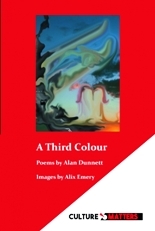 As Bernard O’Donoghue says in his introduction, these poems are ‘about the things that matter in life, love and hurt and justice’ – definitely poems for a frightening century. They are not always easy to read, for two reasons: you may have to keep checking the notes at the back, to find out what is going on, and they are about some very distressing subjects – suicide bombers, Grenfell, our attitude to refugees. ‘Succour’ is a dialogue between a man from the Third World who has nothing and a man from this world who is sympathetic ‘but we’ve got problems here’. And there is also a good poem about Brexit. ‘In Bed with Macbeth’ stands out for me. It is written in the voice of a guilty woman with intolerable memories; innocent victims of torture and displacement are also unable to forget their past. There are some colourful, modernist illustrations by Alix Emery, and a red dot keeps appearing as you turn the pages; this is a symbol of a ‘physical bleeding hole’. London Grip Poetry Review – Donald Gardner	Romeo & Juliet, Birmingham Royal Ballet, Sadler’s Wells. Review by Julia Pascal.